HomeNewsCould Trade Fight Erode Trump Support in Rural America? Could Trade Fight Erode Trump Support in Rural America? SPOKANE, Wash. (AP) - Gary Bailey is certain China is trying to rattle Donald Trump voters with its threat to slap tariffs on soybeans and other agriculture staples grown in rural America. The wheat farmer in eastern Washington, a state that exports $4 billion a year in farm products, is also certain of the result. "It's a strategy that's working," he said. If farmers are worried, so are Republican politicians, who depended on small-town America to hand them control of Congress and know how quickly those voters could take it away. Just seven months before the 2018 midterm elections, Trump's faceoff with China over trade has exposed an unexpected political vulnerability in what was supposed to be the Republican Party's strongest region: rural America. The clash with China poses a direct threat to the economies in both red and blue states, from California's central valley to eastern Washington through Minnesota's plains and across Missouri and Indiana and into Ohio. They are regions in which the GOP's quest to retain its House and Senate majorities this fall is tied directly to Republican voters' views about their pocketbooks and Trump's job performance. The signs of fear and frustration about both are easy to find. In southwestern Minnesota, soybean farmer Bill Gordon says the volatility in the markets makes it harder for farmers like him to market their crop and lock in profitability. The state is the country's fourth-largest exporting state, and the state's top farm export market is China. A Trump voter, Gordon said right now he's disappointed, not angry, over what's happening. 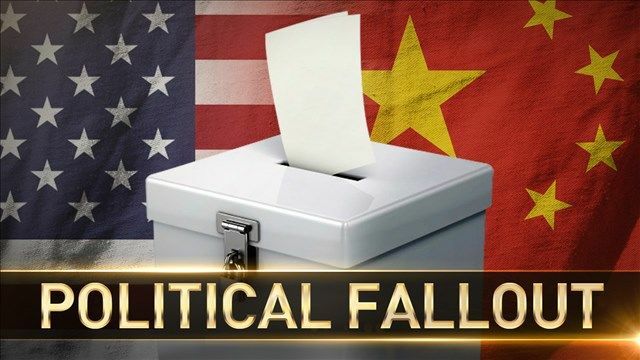 But the trade tensions could affect his vote in the open race for the region's congressional seat, where the farm vote is significant. "I vote for the people who represent rural America," he said. "It's not a party line." Trump says he's simply fighting against unfair business practices with a geopolitical rival. Trump escalated the standoff further on Thursday by asking the U.S. trade representative to consider $100 billion in additional tariffs against China, which had previously released plans to impose retaliatory tariffs on frozen pork, nuts and wine in response to Trump's intent to apply duties to imported aluminum and steel. Trump won 89 percent of America's counties that produce soy, according to an Associated Press analysis of Agriculture Department and election data. In those counties, on average, two out of three voters supported Trump in 2016. "We're in kind of a farm crisis," said Bob Worth, who grows soybeans, corn and spring wheat with his son on 2,200 acres (3.4 square miles) near Lake Benton in southwestern Minnesota. He wouldn't say how he voted in 2016, but he offered kind, if measured, words for Trump. "I'm going to believe in the man," added Worth, who's also on the board of the Minnesota Soybean Growers Association. "He's doing this for business reasons only. I don't know if he knows how much he's hurting agriculture." Matt Aultman, a grain salesman and feed nutritionist in Greenville, Ohio, west of Columbus, said farmers there are keeping a close watch on the talk in Washington. Farmers pay attention to two things: prices and weather. And a trade fight that affects prices won't go unnoticed. In California's central valley, Republican Rep. Jeff Denham has avoided the issue altogether in recent days. His opponent, Democrat and longtime family farmer Michael Eggman, said Trump's trade policies would shatter his community. "We all know how hard it is to make ends meet as a small family farmer, and Trump is not making it easier," Eggman said. "Jeff Denham, who claims to be a local farmer, hasn't said one word about it. Where's the outrage?" Denham, through a spokeswoman, did not address the president's moves directly. In Washington state, wheat farmer Bailey credits Trump with doing some "great things" on other fronts. But on trade, he said, "When we ask him to back off, he just keeps going forward." Trump voter: "I vote for the people who represent rural America," No you don't. Astounded by Bob Worth's comment that he doesn't know if Trump realizes how much he is hurting farmers and rural-based businesses. A good leader -- a competent, responsible leader -- makes sure he or she knows how everyone will be affected by his actions. As long as people like you decide to "believe" in those who are devastating farmers and rural communities with their ruinous policies, no one can hope for anything but a deepening of the farm crisis. I grew up on a family farm in Nebraska and still am keeping the farmland going. I pay significant income tax and property taxes in Nebraska, even though I cannot vote there. People who can't see the damage being done to their own interests by Trump's serve-only-the-wealthy policies are undermining farmers and farm communities. Shame on you. If you think Trump is the cause for the current situation in the Ag Economy you've either fallen and bumped your head or you've been in a coma for the last 4 years. Commodity prices and profitability have stunk for the past 4 years and he's only been in office for less than a year and a half. This situation was already here regardless of who became president. While we all want what is best for ourselves and families it is very self centered and unrealistic to believe that every foreign, domestic, or trade policy has to specifically benefit us. There are other industries in America besides just Ag. If you wanted an unbiased opinion on how the economy is doing look to the FED where it is based on the numbers. When they are increasing rates and project to increase rates several times over the next couple of years they feel the economy is performing well. It has long been said that the farm economy is better when the general economy is down and vice versa so it's a fair argument if you want to say he may not specifically be the best thing for farmers but that doesn't mean he and his policies aren't the best thing for all of America.